By about 3:30 p.m., news helicopters were capturing compelling images of the jet partly submerged in the water and surrounded by rescue boats and commuter ferries. Numerous emergency vehicles could be seen on the New Jersey shore, responding to the incident. By 4 p.m., the plane had sunk into the frigid waters. MSNBC reported that the pilot had radioed air-traffic controllers shortly after takeoff to say that the plane had collided with a flock of geese. Losing altitude, the pilot reportedly opted for a water landing. A survivor told reporters that he was sitting next to the wing when the engine exploded and the pilot announced, "Brace yourself. We're going down." What are called "bird and wildlife strikes" have caused hundreds of millions of dollars in damage to U.S. civil and military aviation over the years, as well as loss of life. Says Todd Curtis, founder of Airsafe.com and an expert in aviation service: "The risk is real. Birds are a threat every day, but only on rare occasion do you have them causing a crash." He explains that an Airbus A320, the type of plane involved in the crash, has an engine designed to sustain damage from up to a 4-lb. bird. "The real hazard is if you have simultaneous damage with a flock of birds. I don't know what happened in this case, but multiple engine failure due to bird strikes can bring an aircraft down," he says. 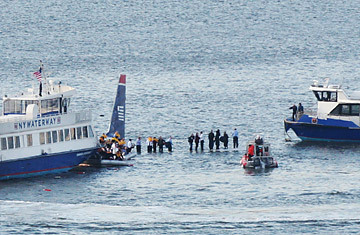 By a little after 5 p.m., the plane had been towed to the Manhattan shoreline. In the few minutes after the crash, all passengers apparently got off safely and only a few had to be hospitalized. All those were in stable condition. Said Weiner, the eyewitness: "You could see the [rescue] boats got there in two minutes. You could see it looked like the people were getting off and onto the boat." The accident appears to have had a much better outcome than many similar incidents in U.S. aviation history. In January 1982, an Air Florida flight crashed into the Potomac in Washington. That plane was not fully de-iced on a 24°F day; only five people survived the accident, in part because it took a while for rescue vehicles to get to the plane in the cold water. In this case, the landing and quick response of rescuers appear to have worked in the favor of survivors. Says Weiner: "It seemed like the plane was really in control as it came into the river. It was almost as if the river was like the runway. It was approaching it like it was a runway until it hit the water, and then you didn't know what to expect. Thank God it stayed in one piece and just slid along its belly." At a press conference soon after the incident, New York City Mayor Michael Bloomberg said that the plane's pilot Chesley Sullenberger, 57, who used to fly F-4 aircraft for the U.S. Air Force, walked up and down the aisle twice to make sure no one was left on the plane. Airplane crashes have become rare in the U.S. and water landings even rarer. Says Amanda Ripley, a former TIME writer and the author of The Unthinkable: Who Survives When Disaster Strikes: "All the instructions they tell you to do  taking the life vests from your seat, grabbing a cushion as a flotation device  are all very difficult to follow in that kind of a landing. Hitting the water is incredibly jarring. It is quite an impact. Many people may black out." Adds Ripley: "The plane sinks quickly. You have to recover from the shock, unbuckle your seat belt and get up and out of the cabin. There is very little time to react. That is the challenge."